Monday – time to spend eight hours with people you wouldn’t normally give eight seconds. 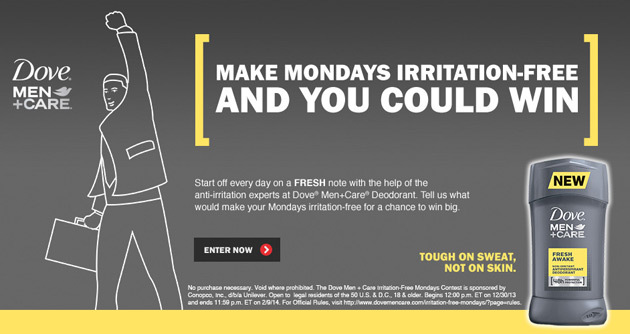 Who would you kill for an Irritation-Free Monday? Whoa, that answer came out of your mouth way too fast. Now that you made it all weird, let’s quickly switch gears to what DOVE Men + Care can do for you, within the confines of the law. 1) Installation of a luxury nap room in your office. 2) Food truck bonanza at your place of employment. 3) Personal trainer and a home gym. 4) B-ball irritation therapy, which consists of DOVE installing a full basketball court in your office parking lot. 5) $5,000 to start your own business. 6) A traffic free commute via a helicopter ride to your office. If you still aren’t thoroughly convinced that DOVE cares about your feelings and your life, the new line of deodorant and antiperspirant proves that DOVE also cares about eliminating the funk you spread in that cube farm at your job. Whether you like blondes (DOVE Men + Care Deodorant), prefer brunettes (DOVE Men + Care Antiperspirant) or redheads (DOVE Men + Care Clinical Protection), DOVE realizes that variety is the spice of life.